Rushall Comes Joint Second in Kitchener's Award 2018. The community cafe is coming to Rushall Village Hall. Held in Rushall and Charlton Village Hall. Call in, take a seat and enjoy a drink and a cake, a chat and meeting friends old and new. Rushall has installed boundary gates to the village. This is an attempt to slow down traffic. Statistics show that villages across the UK have benefitted from entrance gates in the absence of traffic calming. Rushall PC received a grant to assist with the installation of the gates. Well done all those villagers who braved it out in the wet to help with the 'Spring Clean'. We met at Charlton St Peter on Saturday 7th April with our pickers and yellow jackets. The village is in pretty good shape, but much of the litter we collected was on the road to the Woodbridge and on the junction of the A345 to Devizes. Well done also to the Wornes family who have been trying to stay ontop of the litter outside of their house, braving the traffic hitting Pewsey Road. Rushall has been named Wiltshire's best kept small village - Lawrence Kitchener Award 2017. Presentation of the award will take place in Rushall Village Hall Sunday 1st October at 12.00pm, followed by lunch (kids free) and a Harvest service at St. Matthew's Church, Rushall. All welcome. Has your summer been improved by visiting your local pub? Does it offer great drinks, fantastic food, a warm welcome for families or is it an all-round community champion? Following the success of my Independent Shops Awards in 2014 in which thousands of people voted for their favourite local places to shop, I wanted to run a similar competition to help support and recognise our great local pubs. Pubs play a vital role at the heart of local communities and create thousands of local jobs. There are four categories - and of course any pub can be nominated in any or all of the categories. The wining pub in each category will receive an award from me and from the All Party Parliamentary Beer Group, and if your nominated pub is a winner you will be entered into a draw for a £200 voucher to spend in your favourite local. Wiltshire Council is carrying out a routine review of our mobile library routes and would appreciate the comments of the Parish Council and your community on the proposed mobile library schedules for your area. The consultation documents are available to view online from the Wiltshire Libraries webpage athttp://services.wiltshire.gov.uk/MobileLibrary/ from 4th September. Members of the public and customers can make a comment about routes in their community by downloading and completing the Consultation Feedback form. All review documents and feedback forms are also available from the mobile library. The consultation period is from 4th September to 4th November 2017 and during this period we will also be consulting directly with customers of the North and South Mobile libraries. Following the consultation we hope to be in a position to introduce revised routes in February 2018. Your help with this task is greatly appreciated. Rushall signed up to the "Great British Spring Clean" again to have a concerted effort to clear litter from the village after the winter blues. Young and old all joined in on Saturday 4th March collecting rubbish. Wiltshire Council provided high viz jackets, litter pickers and gloves as a kit to support the initiative. The group split into two teams to cover the village from two directions. Eight bags of rubbish plus a sign, cone and car stump guard was collected. Rushall PC, PCC & VHC celebrate the Queen's Birthday. A team of volunteers headed by Dr. Richard Tilbury (Rushall) organised a day of celebrations on Sunday 12th June, to mark the Queen's 90th Birthday. Activities began at Rushall and Charlton St Peter's Village Hall with fancy dress, buffet lunch, competitions and music. We also had the pleasure of music from Trooper Scott Malone from The Royal Tank Regiment. Celebrations were followed by a short service at St. Matthew's Church which flowed nicely into the Annual Rushall v's Charlton Cricket Match at the village cricket green. Queen's Birthday Celebrations in Rushall by Tom Ridge (9 years). Everyone came in to the hall with a blast of joy. Villagers were all dancing to the bagpipes. The man who was playing the bagpipes was as red as a tomato, just about to explode. Everyone was having a monstrous amount of fun. With the raffle I was lucky enough to win two of the prizes: a mug for Mum and a teddy bear called "Squishy". Lots of food was eaten and the lolly pop cake was awesome. To finish the celebrations villagers left to join Reverend Jennifer Totney for a special service at St. Matthews Church. 'Clean for the Queen' - a successful morning litter collecting. May we say a huge thank you for all those who helped out with the litter picking in Charlton St. Peter and Rushall on Saturday, 5th March. We had a great turn out and a large amount of litter was collected, particularly around the village hall. Thank you also to all those working hard at the village hall providing coffee and cake for the community. The Connect 2 Wiltshire bus services that run across the Pewsey Vale and between Pewsey and Devizes are changing from 1st February 2016. Hard copies of the timetables can be requested by calling 01380 860100 or by emailing connect2@wiltshire.gov.uk. 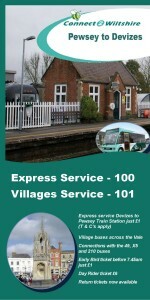 The 100 service is a more direct service between Devizes and Pewsey, via Upavon and the villages along the main route. The 101 service is the more wiggly service between Devizes and Pewsey, allowing for booking from villages to be provided. The 102 - Pewsey Circular - service is a circular route from Pewsey, out to the villages in the west and south of the Pewsey Vale and back to Pewsey. 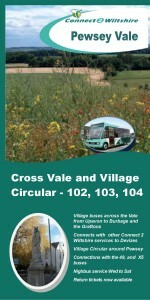 The 103 - Pewsey to Burbage & The Graftons - service is a circular route from Pewsey, out to the villages in the east of the Pewsey Vale and back to Pewsey. The 104 - Pewsey Estates Circular - service links the main housing areas in Pewsey with the centre of the village. Her Majesty's Lord-Lieutenant of Wiltshire, Mrs. Sarah Troughton, was approached by the Woodland Trust inviting her to plant a tree (or trees) in Wiltshire to commemorate the Battle of Agincourt. Walter Hungerford, 1st Baron Hungerford KG (1378-9 August 1449) was an Englishknight, landowner, from 1400 to 1414 Member of the House of Commons, of which he became Speaker, then was an Admiral and peer. He won renown in the Hundred Years War, fighting in many engagements, including the Battle of Agincourt in 1415. He was an English envoy at the Council of Constance in 1415. In 1417 he was made admiral of the fleet. On the death of Henry V he was an executor of Henry's will and a member of Protector Gloucester's council. He attended the conference at Arras in 1435, and was a Member of the House of Lords sitting asBaron Hungerford from January 1436 until his death in 1449. For some years he wasTreasurer of England. Rushall Parish Council have recently purchased the BT Telephone Kiosk on Pewsey Road for just £1. Robert Worrell of The Gardens, Rushall has very kindly refurbished the kiosk which now looks as good as new. The kiosk is currently being used as a map of the village along with a book swap. Please do use it to pick up and drop off books.